– Are you looking at your kitchen and wondering if it can be hand-painted? The answer is probably yes, it can! – We regularly paint new wooden kitchens, or do repaints, but our speciality is upgrading 10 or 20 year old bespoke oak or pine kitchens. – Dark oak, orange pine, MDF, maple, clear lacquered, varnished, waxed, even laminate kitchens and furniture can all be transformed with a hand painted finish. – If you like the layout of your kitchen, and it is functional, but you want a new look, we can clean down your wooden kitchen, prepare and prime it, and apply a flawless hand painted finish in literally any colour of your choosing. 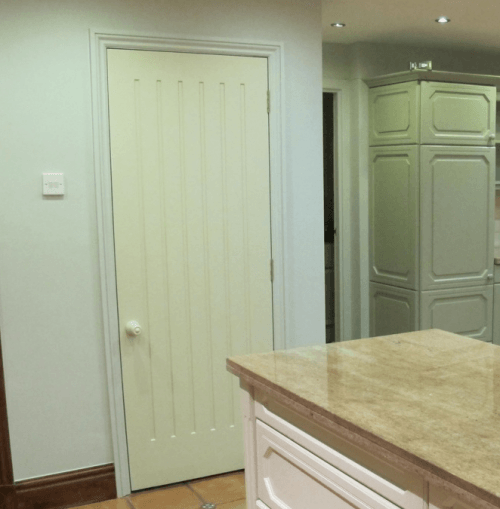 – Older bespoke kitchens are ideal candidates for our services They tend to be really well made, but we check all doors and drawers to make sure they hang and open correctly. We tweak hinges, install new handles if necessary, or replace the odd drawer runner, as part of the service. 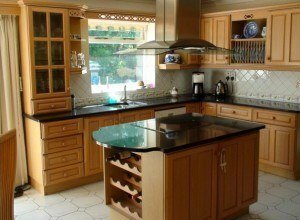 If you want to go a bit further with an upgrade, we can call on our skilled associate craftsmen to advise you and install replacement worktops or new tiles, and even modify cabinets, if necessary. Hand painting older wooden kitchens is what we do! This is how the above kitchen looked before it was transformed! We understand that it is a major decision to hand over your kitchen to a painter, but rest assured, we aren’t just any ole painters. Most of us have been in the trade 20 to 30 years, and we have access to the best products and techniques, hand-painting kitchens, and furniture for clients who expect the work to be done “just right”. Our clients’ words, not ours. 5, 10, 20 year old kitchens (or new installations), our invitation-only craftsmen have hundreds of successes under our belt. Look around the site, we have no secrets about our craft, see the attention to detail, the quality of the paint we use; the lengths we go to, to ensure your project goes smoothly. 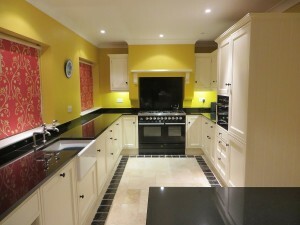 A well made designer painted kitchen will last decades, and can look good for every one of those years, if maintained. We have the products and the experience to repaint the most beautiful painted kitchens and furniture. And it is not unknown to leave a kitchen finished better than it ever was. Great painters should be a delight to deal with too. We believe that there is much more to a kitchen painting service than leaving your cabinets with a flawless finish. Having your kitchen painted is a big deal for most of our customers, and we bend over backwards to try and ease the worry! Excellent communication: We are very good at answering emails and calls and keeping in touch with you. Solid, practical advice: We make sure we understand exactly what you want, and turn that into a specification with the right colours, and the best finishes. Clear pricing: We provide a clear and thorough estimate and stick to our pricing. Prompt and punctual: We work in with your schedule and arrive when we say we will. Trustworthy: Many of our clients trust us with the keys, bringing in the milk, feeding the dog…! It is ingrained in us to do right by you. Because of the strict criteria for being a Traditional Painter member (it is invitation only network), when you and your friends walk in at the end of the project, whichever Traditional Painter has done the work, you will see a super high quality finish and a kitchen way better finished than you probably ever expected. If you are weighing up the cost of a new wooden kitchen, think also about the cost of a hand-painted refurbishment! An average lacquered oak or pine kitchen costs £1500 to £2100 to paint to look like new. Pro rata, a large 35 door “orange pine” kitchen costs around £3500 to clean, sand, prime and finish to showroom condition. The savings when painting your current kitchen to show room standard compared to the cost of a new kitchen from a show room is enormous – the bigger the kitchen, the bigger the saving. We offer a low key / high impact service! 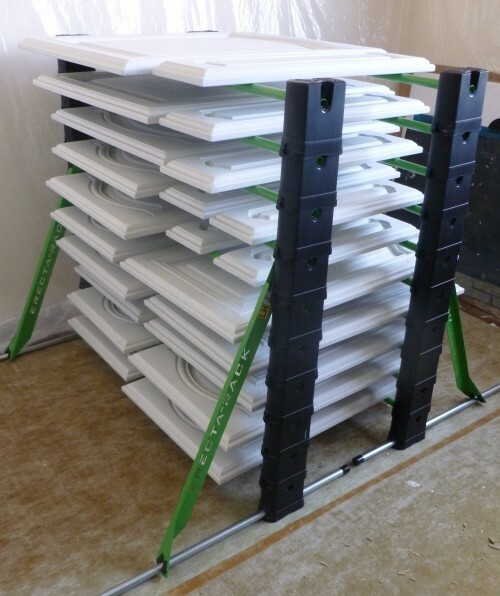 30 doors and drawers neatly stacked and drying, leaving your kitchen usable in the evenings. And did we mention, the cost savings we can offer over a new kitchen are enormous. We save most of our clients literally 10’s of £000’s. If, for example, you have your heart stuck on a new kitchen, but financially, it’s still a few years off, lay out a relatively small amount and hand paint your current kitchen and tide yourself over in style! Or if you are moving home, and your kitchen is proving a major problem to buyers, our hand painting service can make all the difference, turning obstacles to a potential sale (even deal breakers!) into a sale! – If you are putting your property on the market and you are shuddering at what potential buyers will think of your 90’s dark oak cabinets, call us. – Estate agents around the country do advise that a modest investment in a kitchen re-paint can greatly increase the chances of meeting your asking price. If the buyer thinks the kitchen has just been given a quick flick over to look nice for a few months, send them here to see the standard process your Traditional Painter followed to the letter. – If you have purchased a second-hand kitchen, and it needs some serious TLC from an expert painter, or if you have worktops, tiling, or handles in need of replacing, this all comes within our remit. To us this is a vocation, not a job! Look around the site and you will see that we put a great deal of effort and enthusiasm into our work. There is no difference in our attitude between tackling a modest kitchen refurbishment or a huge new luxury bespoke showroom kitchen, or completing a straightforward repaint in a few days. 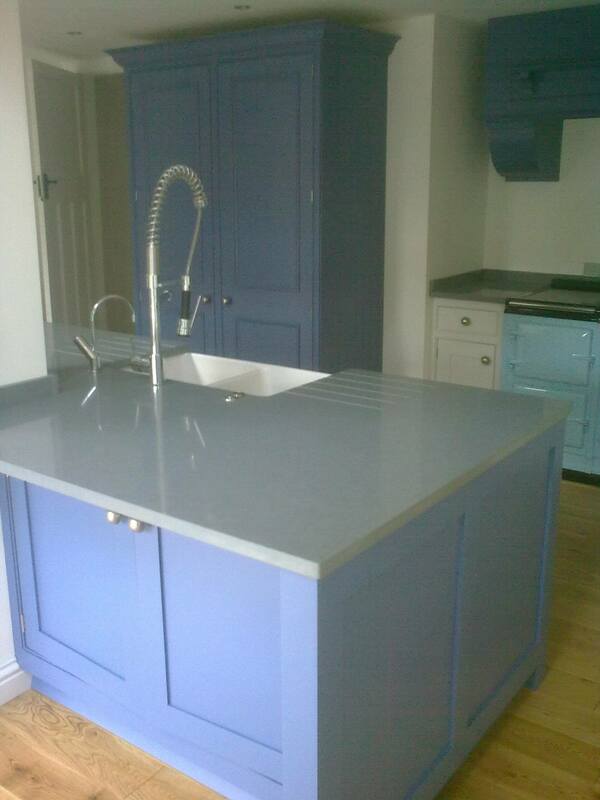 Hand painting and refurbishing kitchens is what we do, very well. Wherever you are in the UK, you are in safe hands. By safe hands, we mean, that many of the things that clients worry about when employing tradesmen – poor time-keeping, poor communication, untidiness, not sticking to quotes – that lack of professionalism was beaten out of us during outstanding apprenticeships, and reinforced while working with the very best in our trade. We are a group of independent kitchen painting specialists around the country and beyond, and the aim is to put you in touch with a recommended Traditional Painter specialist local to you. If you have seen enough, you are welcome to ask for advice or a free no-obligation estimate. Below is a full explanation of the level of service and attention to detail you should expect from a professional kitchen painter, including pricing and advice on options to upgrade your kitchen. Anyone can produce a smooth sample door panel, and many decorators paint extremely well, but as a paying customer, you should be aware that good brush skills is just a part of the service. Using traditional methods and modern materials, we can hand-paint aesthetically tired / dated wooden kitchens; paint new, pre-primed or bare MDF/poplar kitchens, or re-paint luxury hand-painted kitchens. We can paint oak, pine, chestnut, maple and most laminates, and are happy to work on the largest custom installation to the most compact galley kitchen. See below how Traditional Painters can create a stunning centre-piece in your home in any colour using highest quality primers and paints, paying great attention to detail. This is a before and after of a 15 year-old lacquered limed oak Neville & Johnson kitchen. The kitchen was really well-made, the layout was perfect, but the look had dated. 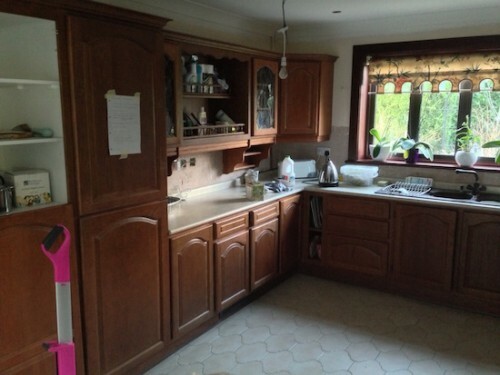 It was a choice between a new kitchen for £10’s of thousands, or refurbish for under £3000. How does it work, painting a kitchen? Using appropriate abrasives and specialist primers, we can prepare bare timber or MDF; clear lacquered oak, lacquered pine; waxed pine; foil wrapped laminate or melamine surfaces. This is a selection of some of the products at our disposal. Once prepared and primed correctly, it doesn’t matter what the doors or frames are made of underneath, they will accept finishing coats, and the end result will be a beautiful and durable traditional hand-painted eggshell or satin matt finish. The specification is all-important, not just any trade paint will do. 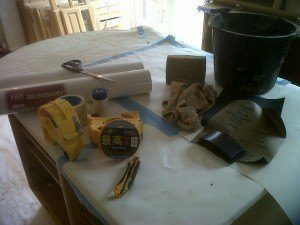 True “kitchen painters” do know what primers and paint to use in different situations! 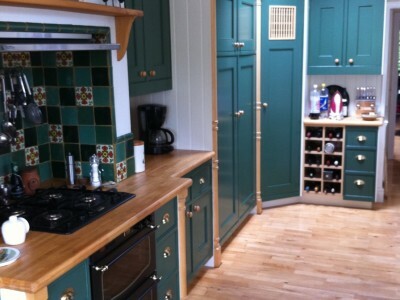 We accept commissions for painting new custom-made kitchens too. This Heatherington Newman kitchen came pre-primed in the factory and it was finished in situ in a two-tone hand-painted oil-based eggshell finish. New un-primed kitchens, fitted furniture, cabinets…they fall well within our brief for transforming the ordinary into something special. 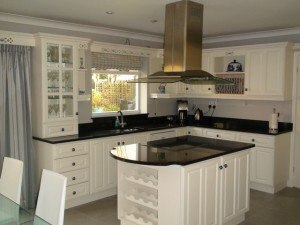 2 – Re-paint bespoke hand-painted kitchens Traditional Painters have worked for some of the best known high-end kitchen manufacturers around the UK. 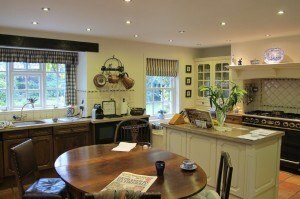 All have the knowledge and experience to be entrusted with the task of re-painting the best possible examples of bespoke hand painted kitchens and fitted furniture. We can go beyond painting to transform your kitchen. With additional touches such as new handles, new work tops, a different floor tile, or fine-tuning your current layout, any functional kitchen can be upgraded without the uproar of starting from scratch. This a good summary of the options available to refurbish a kitchen rather than fit a brand new one. 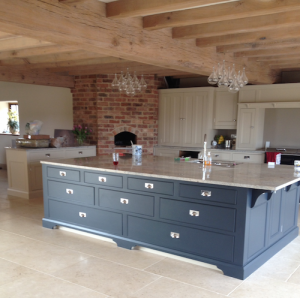 We have painted many reclaimed wooden kitchens, from luxury bespoke to solid mid range and everything in between! This is the scoop on buying (and selling) a pre-loved wooden kitchen with a designer name, which can hand-paint as good as new, saving you thousands. Where do you do the painting work? Ordinarily, we hand-paint kitchens in situ, and promise not to create plumes of dust, or disrupt any other room in the house. Part of our attention to detail is being meticulously clean and tidy. We are heavily invested in vacuums, extraction sanders and where appropriate will even wet sand, ie do whatever is possible to keep the dust to an absolute minimum. We specialise in hand-painted finishes, however there are situations where a spray finish is appropriate, and several of the Traditional Painters have the expertise and equipment to spray paint finishes and lacquers in situ to a very high standard, safely! Do you paint kitchen walls, ceilings, skirtings? We are master decorators, and have many years’ experience re-decorating period property, large and small. Again, we do not just go through the painting motions. We are fully kitted out with dust extraction power sanders, the best rollers and brushes, all the lotions, potions and fillers, plus the knowledge to offer a very efficient high-end re-decorating service. Everybody involved with TP works to one standard – high – and can be trusted to do a fantastic job for you. Our associates are highly skilled decorators in their own right, and their work is completed cleanly and in good time. They represent excellent value for money. For instance, if you have plaster ceilings & walls, T&G ceilings or a lot of other woodwork in the kitchen, they will ensure you get the highest quality finish throughout, to complement the quality of your kitchen cabinets! There should be a Traditional Painter local to you. Traditional Painter is online home to 20 of the country’s best independent kitchen & furniture painting specialists. Please bear in mind that only the painters on this list are recommended and backed by Traditional Painter. If you see any company websites other than those, implying they are part of this kitchen painter group, please let us know. The website was originally set up by specialist decorator Andy Crichton as a platform for his kitchen painting services. Over time it has become online home to an invitation-only group of independent self-employed specialists. They are invited on the strength of their extremely high level of workmanship, attention to detail and customer service. They are more than high quality craftsmen, though, they are a very likeminded and positive bunch that “gets” what Traditional Painter is all about and promotes those values! A big part of being involved with the site is a willingness to freely share knowledge. This helps raise awareness of what really goes into high decorating end work. Regardless of our level of expertise and experience, we all need a hand at times, and this group willingly lend a hand to a lot of homeowners and professionals alike. Traditional painters’ most important critics, if you like, are their clients, and many leave testimonials which back up the information on their profile pages. Several have been, or are still college lecturers, most have been in the trade 20 to 30 years, and are still passionate about their profession. Please contact your local specialist for a free no-obligation estimate. or for further information contact Andy. – Summary of the hand painted kitchen services Traditional Painter offers you. Case studies where you will get a very good idea as to how we would go about painting your kitchen. 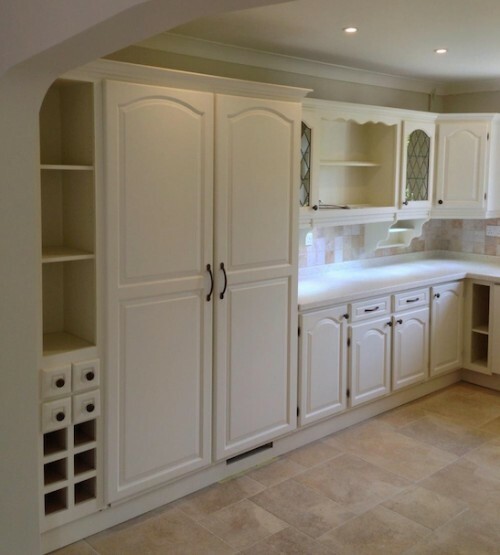 It is easy to say that painting your kitchen is fairly straightforward, it is what we do! But it maybe doesn’t look so straightforward from your side. These are questions we get asked all the time, in no particular order. Although a refurbished hand-painted kitchen is by far the most economical way to upgrade and extend the life of a functional but tired kitchen, it is definitely not a cheap-as-chips option. Full kitchen refurbishment To arrive at an approximate cost to prepare, prime and paint a natural wood kitchen (ie the full “transformation” specification), count up all the cabinet doors and multiply by £100. That should give you a ballpark of the sort of money involved for a full refurbishment. 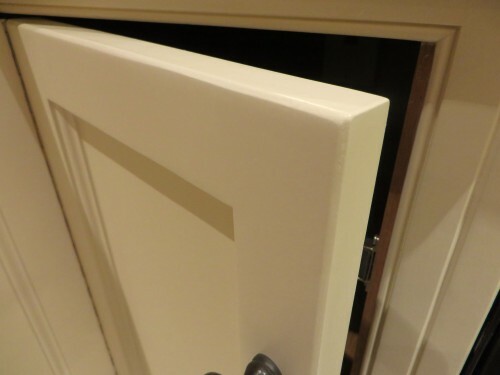 This £100 a door formula is a ready reckoner that we have developed that allows for painting both sides of all the kitchen doors, drawers, pelmet, cornice, plinth, end panels and frames ie the full kitchen to the highest standards, nothing missed. Usually this budgeting formula is spot on accurate with the fixed price quote you receive, but sometimes clients wonder why the quote is a little bit different from the £100/door. Quite simply, some kitchens have extra features such as exposed shelving, an overmantel, or a cooker hood which we would treat as “a door” too. Do you paint insides of cupboards? Insides of cupboards are not painted as standard. We can do so if required at extra cost, but to be honest, the interiors of the majority of wooden kitchens are veneered, laminate or oiled in the factory. It is very labour intensive to oil or paint insides of cupboards, 60-100% on top of the base price for painting a kitchen! That is why it pays to have well lined cupboards from new. We can show you what to do as far as oiling and what product to use, if that helps. On glazed doors, the interiors are often painted, as they are on display. They can be picked out in a contrasting colour, to good effect. It would be an additional cost to the £100 a door formula. Our prices are fair to both our clients and the specialist, and ensures the best result. If you are comfortable with the sort of budget we work to, let’s talk, and we can prepare you a fixed price no obligation quote. If you want to go for cheaper quotes, that is fine too, but do make sure you are getting like for like. We could quote for one less coat and undercut the under-cutters, but we have the long term in mind. And just to clarify, these rates will secure you the services of a specialist kitchen painter with many years’ experience, and no stone left unturned to give you a beautiful durable finish. I can assure you that preparing and painting your kitchen is not a job for an everyday decorator. Like any specialism, the skills involved go way beyond the ability to paint well. Extensive product knowledge is important, but not the be-all and end-all of hat makes a good kitchen painter. The work is incredibly repetitive, but to a very high level, and requires equally high levels of concentration and dogged determination to maintain standards and attention to detail from start to finish. There is no place to hide, because as you know, your kitchen doors will be literally in your face, day in day out and they better look rather nice! If you would like a free quote, it is best to start the process by contacting the recommended TP kitchen painter closest to you, direct from their profile page. 1 – Clarify what sort of kitchen you have (oak, clear lacquer, waxed, laminate…) and how many doors. 2 – In addition to painting, do you envisage any upgrades, as in new handles, new worktops, additional cabinets or new flooring? If so, please include some brief details / ideas as we do work with trusted joiners and fitters. 3 – Please email us photos to give a better idea of the scope of the work. We often see things in photos you may have overlooked! 4 – With that initial information, it is usually sufficient to prepare a fixed price quote. In some circumstances, we may arrange to come and see your kitchen – if something is unclear about the surface and the preparation required. But I would say 90% of all enquiries can be specified and quoted with a fixed price, if you follow the above guidelines. 5 – If the price is within your budget, then the decorator who will be doing the work can finalise dates, terms and colours. 6 – If you are struggling with colour, your Traditional Painter can help, having painted so many kitchens, certain colours do lend themselves. Or if you prefer a more comprehensive consultation, I can highly recommend Emma Culshaw Bell: paint colour advice. Please note that most Traditional Painter specialists are working to a 12-week lead time, and unless they have a cancellation, it is unlikely they will be able to paint your kitchen at short notice. This lead time isn’t really a problem for most of our clients, because a kitchen refurbishment is a big decision and usually takes quite a bit of planning – 12 weeks soon whizzes by. So, once you have decided to tackle your kitchen, get in contact with your local TP specialist and they will give you the painting information you need in good time. 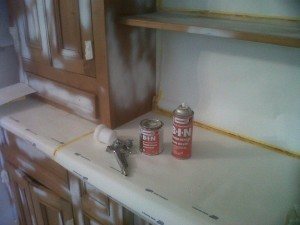 There’s more to painting kitchen cabinets than meets the eye! 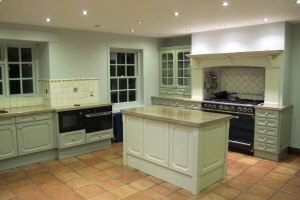 If you are interested in the full story behind the pictures of finished painted kitchens, below I have gone into detail about what we have to think about regarding choice of paint, different specification options for wood primers and sealers and the practicalities of painting kitchen cabinets. I think what follows will give you a good idea of the level of service you can expect. How many coats to hand-paint a kitchen? If you want to know how to DIY paint kitchen cabinets yourself, here is a good description. And good luck. With time, patience and good kit, it can be done, and done well!